I Like Paper kids water-resistant watches are a surprisingly durable new take on a typical timepiece. Lightweight, flexible, tear-proof, and water-resistant Tyvek® paper is the recyclable foundation for the fun watches that are all handmade in Berlin, Germany. Artist- and illustrator-designed patterns pack each one with cute dinosaur fierceness or sweet unicorn charm. Dimensions: 7.75" x 1.25" x 0.3"
just love these unique gifts! I bought this for my niece and she absolutely loved it!!! The water-resistant watches from I Like Paper are all handmade in Berlin, Germany, and come from the creative mind of Maker and graphic designer Marc Aurel Hartung. He wanted to try something different when it came to watches because he felt like traditional timepieces had become dated, with many of us relying on our phones to check the time. So Marc turned to an unexpected—but eco-friendly—material: Tyvek® paper. Tyvek is tough for paper. Even though it’s lightweight and flexible, it’s tear-proof and water-resistant. Marc chose Tyvek because of its long-lasting durability and because it’s recyclable, too. 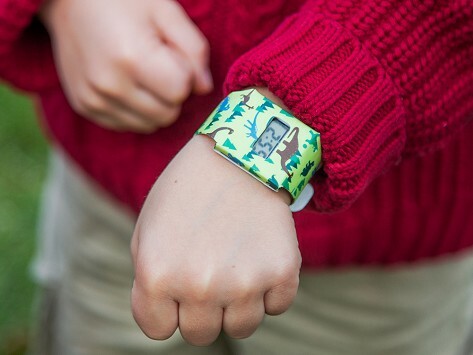 Artist- and illustrator-designed prints pack the watches for grown-ups and kids with colorful personality. The result of I Like Paper’s by-hand approach is an anything-but-ordinary watch made to stand out for how it’s made and how fun it is.